You may have been taken aback by the an array of t-shirts and prints available for purchase at TechArtista lately, which bear a similar aesthetic to the elaborate black and white murals lining the walls and instantly turn the wearer into a walking piece of art. 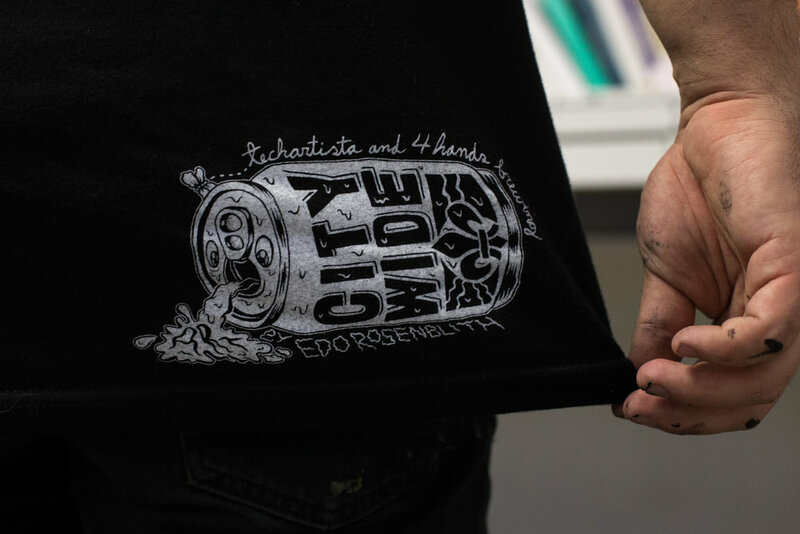 The t-shirts were funded through a partnership with local craft brewery 4 Hands Brewing Company, who select a new group of creative, entrepreneurial and nonprofit organizations every quarter in St. Louis as beneficiaries of the City Wide Pilsner Grant. If you’re thinking it takes a special company with a strong altruistic ethos to pull off a grant program like that, you’d be correct. To fund the grant, the brewery donates $1 of every City Wide Pilsner case purchased to the program, looking for innovative, inspirational companies as partners. The brewery selected TechArtista as one such company. “Our goal with the program is to collaborate with entrepreneurs and small business, and to be inspired by people in St. Louis who are working hard to bring innovation to the city,” says Liz Swyers, market manager at 4 Hands. 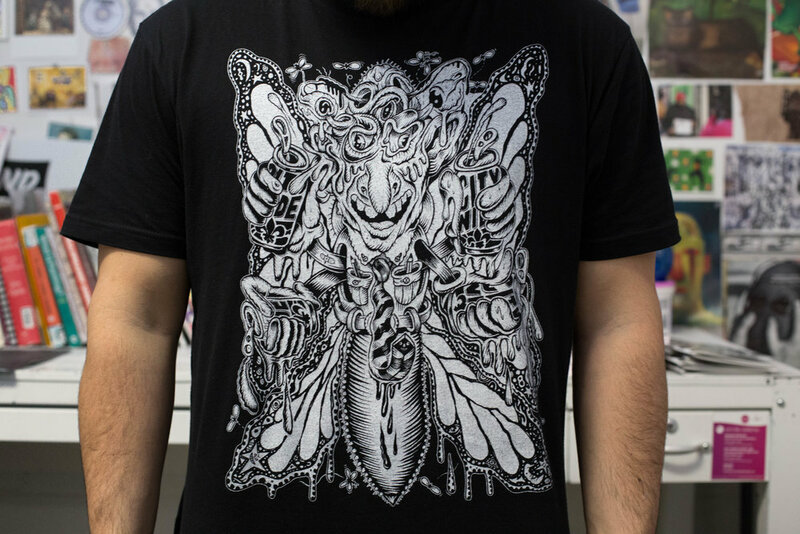 The t-shirts are emblazoned with a stunning design of a haphazard butterfly preparing to guzzle a CityWide brew, drawn by artist Edo Rosenblith, who also painted the murals. “I was thinking, ‘What animal would be the worst drunk? A butterfly came to mind, and of course a butterfly has four arms, which fits perfectly with the 4 Hands brand,” says Rosenblith. TechArtista co-founder Chris Holt met Rosenblith a few years back, requesting a mural for the space. Rosenblith, inspired by the communal feel of the interior and the many creatives gathering within its walls to manifest their dreams, depicted another type of shared space: the dinner table. “Then I thought of the two most universal images of people eating together: Da Vinci’s ‘The Last Supper,’ and Norman Rockwell’s painting, ‘Freedom From Want,’ which depicts an American family sitting around a dinner table preparing to eat,” he says. “Then I combined the aesthetic and deeper messages from both of those paintings into the composition.” He busily worked on it for a month, first creating a large sketch and then spontaneously fleshing out images and ideas as he worked. With funding and the finalized design in-hand, TechArtista looked to the t-shirt screen printing shop House of Eight Legs on Cherokee Street, run by Nathan Prater. Prater has also worked with Rosenblith before, and is a devoted supporter of the artist. “This is the second project I’ve done using Edo’s art. Not only is he ridiculously talented, but he is very gracious and has trusted putting his work in my hands. I cannot tell you how much that means to me. ‘Here’s my art, I trust you,’ is just about the most flattering thing an artist could ever say to me,” says Prater. Working with local and community-centered organizations to accomplish projects is a hallmark of the TechArtista mission. It’s just one example of the projects in the pipeline and horizons to be conquered. T-shirts and prints can be purchased at TechArtista, 4818 Washington Blvd, or online here.